Anywhere data lines run and are susceptible to transient over voltages, a data line protector is needed. 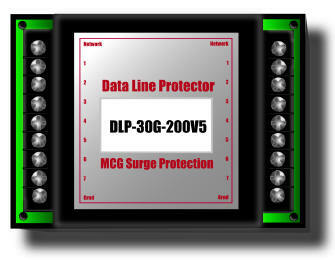 MCG’s industrial-grade DLPs (Data Line Protectors) prevent damage to modems, fax, Telco, I/O ports, 10 and 100BASE-T, terminal, instrumentation, hubs and more. MCG's New 19" Rack Mount Protection support from 12 to 32 Ports. Units are available hardwired for universal installation or with RJ11, 21X, 45 or BNC connectors. Clamp voltages to 200V standard. Protects from 2 to over 250 wires. DIN rail option available on some models.